These garden wooden arches are manufactured from quality timber. This wooden garden arch will add a focal point to your garden adding interest to pathways trough your garden. Timber garden arches are an ideal support for climbing plants. Timber arch easy to assemble with four sections and full height one piece side sections. Includes instructions and fittings. Dimensions: 212cm high x 118cm wide x 40.5cm deep. These wooden rose arches are manufactured from quality timber. This wooden garden arch will add a focal point to your garden adding interest to pathways trough your garden. Timber garden arches are an ideal support for climbing plants. Timber arch easy to assemble with four sections and full height one piece side sections. Includes instructions and fittings. Green in colour. These garden wooden archways are elegant but sturdy wooden construction. This timber arch makes a great feature which can be enhanced with climbing plants. 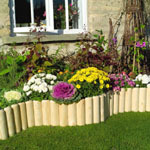 These wooden garden arches can be sunk into the earth or concrete or with metal ground spikes. Size: 2.18 metres High x 1.14 metres Wide x 0.40 metre Deep. 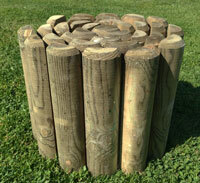 Set of four ground spikes for use with the garden wooden arches above.